The Zillah Teapot Gas Station, a local landmark just about 15 miles South of Yakima off of Exit 54 on I-82 was constructed in 1922 by Jack Ainsworth of Zillah. The Teapot was born of a government scandal involving the Secretary of the Interior, Albert Fall. Late in 1921 the Naval oil reserves at Teapot Dome, WY, and Elk Hill, CA, were put under the direction of the Department of Interior. Secretary Fall shortly thereafter leased the Teapot Dome Fields to oilman Henry Sinclair and Elk Hills went to Edward Doheny. This was done without any competitive bidding or following the proper procedures. A Senate investigation uncovered unlawful financial dealings between the two men and Fall. Fall was convicted of accepting a bribe and sent to prison for a year. Sinclair was convicted of contempt of the Senate. 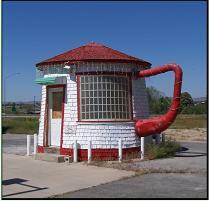 During this time Ainsworth planned and constructed the Teapot Gas Station. Later in 1927, by the Supreme Court, the oil fields were returned to control of the United States Government. The historic building has survived many trials through the years including a relocation making it easier to access from I-82. One of the oldest operating stations at one time the Teapot is currently closed. Listed on the National Register of Historical Places it makes an interesting stop for the family to see a unique bit of the past. Reported by the Yakima Herald Republic on January 18, 2007 the City of Zillah has agreed in principal with the owner of the Teapot to purchase the structure and the two acres that it sets on. The City has one year to raise the $ 125,000. purchase price. The building will then be moved to another location closer to Zillah and will be converted to a tourism information center. 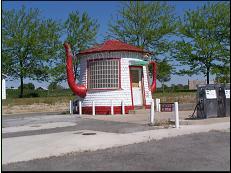 Although it would be sad to see the Teapot not operating as a gas station any longer it would be great if it is preserved. Serving such a good purpose as a tourism information center can only publicize the Teapot and its history to more of the public. Reported by the Yakima Herald Republic on November 3, 2010, the City of Zillah has received a $ 287,000. federal grant to move the "Zillah's historic Teapot Dome gas station". The Teapot will be moved onto a one-acre lot on First Street near the Civic Center. "The site of the project will eventually feature a park, benches, a parking lot and an awning over old, gravity-style fuel pumps -- replicas of ones once used at the station," Mayor Gary Clark stated. Work should start in the spring of 2011. Approximately a year after work was anticipated to begin, the Zillah City Council on January 17, 2012 approved awarding a contract to White Bird, Inc. of Wenatchee, Wa. in the amount of $ 390,728 to move and refurbish the historic Zillah Teapot Gas Station. Work is expected to be completed in early summer of 2012 but as seen with the progress so far delays are possible. The new site is located at 117 First Avenue in Zillah and when completed will feature a refurbished Teapot that will be used as an interactive kiosk for visitors, old, gravity-style gas pumps, a parking lot, benches and modern restrooms. A final resting spot for the Teapot will be a welcome addition to downtown Zillah.